We’d been dying to take a wine tour through Paso Robles and decided Memorial Day weekend would afford the time to do so. My darling dogs were not so keen to be dumped in a kennel so I endeavored to find dog friendly wineries that they could visit. The result was a wonderful and tasty getaway which the dogs also enjoyed. 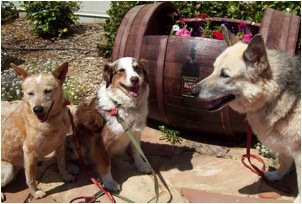 Other wineries were okay with the dogs in the parking lot: EOS, Meridian, Martin & Weyrich. The most difficult part of the trip was finding shaded areas to park while we went in to taste. In cases where shade wasn’t available (Chumeia and Meridian) we split up so one of us could stay with the dogs. Lunch breaks were pretty easy at restaurants with outdoor seating. Remember to ask first before letting dogs romp around, even at locations listed here. Most owners thanked us for asking and then gave us leave to let the dogs out. Keep your dogs leashed. Remember many people have a fear of dogs and some wineries have very nice gardens. Tread carefully. Be a courteous and responsible dog owner and hopefully the “dog friendly” list will grow!